Oda Nobunaga (1534-1582) - In the same way the British Isles were populated by migrants from mainland Europe, the Japanese islands were originally populated by people from mainland Asia. This gave rise to independent kingdoms which were ruled by warlords. Over time, as the kingdoms expanded, they eventually came into conflict with one another. This was known as the Warring States Period (or Sengoku). And just as England would gradually be unified by the likes of King Egbert and Alfred the Great, these rulers would try to do the same in Japan. The warlord celebrated for initiating the eventual unification of the islands into a single country is Oda Nobunaga. He was born in the Owari Province on the southern end of the main island of Honshu. His father was Oda Nobuhide, a military leader known as a shugo. But he died in 1551 when Nobunaga was still young, setting off a power struggle for succession. Nobunaga himself was not considered much of a contender due to his immaturity and erratic behavior. For example, at his father's funeral, he threw ceremonial incense on the altar, which was considered a sacrilege. This and other bizarre actions earned him the nickname, "The Fool of Owari". He was his father's successor, but his uncle, Oda Nobutomo quickly seized power. The prospect of becoming a leader himself must have sobered Nobunaga because he wasted little time in trying to acquire what was rightfully his. He made an alliance with another uncle, Oda Nobumitsu, and overthrew Nobutomo in 1555. Nobutomo had lived in Kiyosu Castle, which now became Nobunaga's. The death of his uncle and the possession of the stronghold Kiyosu, placed Nobunaga in a position of power in Owari. But he didn't quite have control of the Oda clan yet. His younger brother, Nobuyuki, challenged him. After a couple years of civil war, Noubnaga overcame Nobuyuki and killed him in 1557. 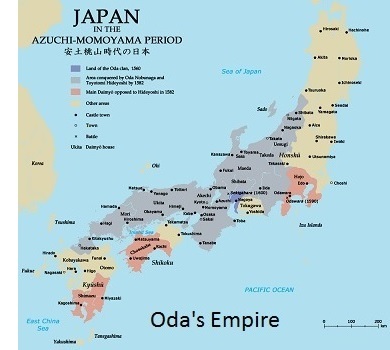 By 1559, both the Oda clan and Owari Province were under his complete control. This raised the alarm of the Imagawa clan in the neighboring Suruga Province. Its leader, Imagawa Yoshimoto amassed an army of 25,000 soldiers and marched on Owari in 1560. Nobunaga could only muster 3,000 defenders, but he marched to meet Yoshimoto nonetheless. 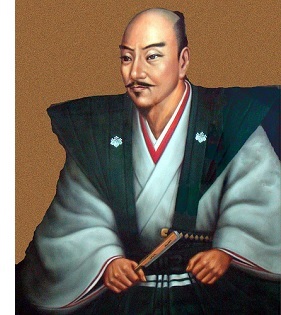 Yoshimoto's army was camped in a narrow gorge called the Dengaku-hazama. Nobunaga deceived Yoshimoto by making thousands of dummy soldiers stuffed with hay and placing them at the top of the gorge. This gave the impression that Nobunaga's army was much larger than it actually was, and it allowed his real army to sneak around behind the enemy while they kept their eyes fixed on the fake one. On the day of the battle, known as Okehazama, a fierce thunderstorm erupted and bogged down Yoshimoto's army in the gorge. 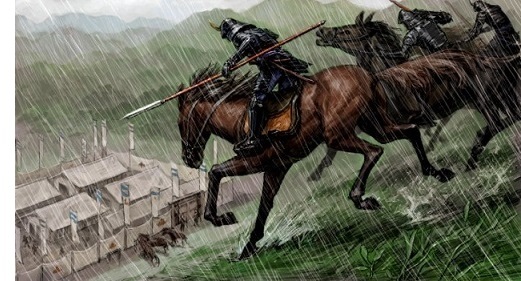 When the rain let up, Nobunaga's army attacked and took the enemy by surprise. Yoshimoto was killed early and his army quickly folded. This victory against overwhelming odds, greatly enhanced Nobunaga's reputation. The following year, more fortune ensued when another rival, Saitō Yoshiatsu, died leaving his kingdom to a weakling son, Saitō Tatsuoki. Nobunaga took advantage and attacked, conquering Mino Province and capturing its capital of Inabayama in 1567. Nobunaga made it his capital and renamed it Gifu (a reference to legendary Mount Qi from which ancient China was unified). Now he controlled almost all of southern Honshu Island. But apparently he wasn't content with this accomplishment because he adopted a new royal insignia with the motto Tenka Fubu which means "All the nation under one sword". In 1568, he made an alliance with a warlord named Ashikaga Yoshiaki to attack Kyoto, the major city of southern Honshu Island. A rival clan known as the Rokkaku opposed this and went to war with Nobunaga. Nobunaga proved too powerful though and conquered the Rokkaku. Shortly after, they took Kyoto and Yoshiaki was installed as shogun (although Nobunaga was the real power of the region). And it was this fact that would end their alliance. Yoshiaki did not like being a puppet of Nobunaga and began reaching out to rival daimyos in order to break away from Nobunaga's influence. In 1570, the Battle of Anegawa was fought between an alliance of the Oda and Tokugawa clans against an alliance of the Azai and Asakura clans. Once again, Nobunaga was victorious. He was becoming more powerful and perhaps corrupted as well. A local Tendai Buddhist monastery on Mt. Hiei known as the Enryaku-ji, sided with the Azai-Asakura alliance and committed several warrior-monks (known as sōhei) to the battle. Though it was considered an important center of learning in Japan, Nobunaga burned it to the ground and killed about 4,000 men, women and children. He finally suffered a setback though in 1571 at Nagashima where he took heavy losses including the deaths of a couple of his brothers. Nagashima was a region (near present-day Nagoya) protected by a series of forts. Refusing to give up, he persisted for three years and finally conquered it in 1574. This left only one clan in the area that posed a threat to Nobunaga and his ambitions. That was the Takeda clan. Once again he teamed up with the Tokugawa clan and defeated the Takeda at the Battle of Nagashino in 1575. Now the entire southern half of Honsu belonged to Nobunaga. However, as he turned his attention to the northern half of the island, he would face an opponent unlike any before. His name was Uesugi Kenshin and he was regarded as perhaps the greatest general on the island at the time. Kenshin ruled the Echigo Province just to the north of where the Takeda had ruled. Initially, Nobunaga and Kenshin had maintained an uneasy alliance as they both considered the Takeda a common enemy. But now with their defeat, Kenshin viewed Nobunaga as a threat and the alliance ended. The relationship was further strained when Nobunaga began building Azuchi Castle on the shores of Lake Biwa which was in striking distance of Uesugi territory. Kenshin moved fast to neutralize the threat by marching an army south in 1577. Nobunaga countered by marching his army north, and the two met near the borders of their realms at Tedorigawa. Kenshin proved the greater tactician and won the battle. This could very well have been the end of Nobunaga's expansion and perhaps could have even seen his own territory threatened as Kenshin was preparing for a second attack. But he died suddenly in 1578 (of an unknown, but probably natural cause) thus eliminating Nobunaga's greatest potential threat. Now it appeared nothing could stop him from uniting the entire island and perhaps all of Japan under a single banner. But it was not to be. In 1582, as he was preparing to invade Echigo, Kenshin's old kingdom, one of his generals, Akechi Mitsuhide, launched a coup attempt. He was in the Honnō-ji temple with only a small personal guard present when Mitsuhide and his followers surrounded the temple and set it on fire. Nobunaga chose ritual suicide (known as seppuku) rather than being burned to death. No other warlord before him had conquered as much Japanese territory as Nobunaga had.